The trimmed Milo tree that we held with little regard until manager Mike told me its story. Yesterday morning, as I wandered the area looking for interesting vegetation, I was particularly curious as to the trees that often appear in our photos when we take shots of the ocean from our lanai. Originally, their recently trimmed appearance was somewhat of an eyesore in our photos. More than once, I maneuvered the camera in such a way to ensure they weren't included in the photo. Another trimmed Milo tree on the grounds. Now, I feel a little foolish after meeting Mike, the property manager here at Milowai, our condo complex, explained this building was named after these interesting trees, "Milo," after the Milo tree, with the "wai" meaning "water," tree by the water. Mike explained they are a hearty tree with a major significance to the Hawaiian people as indicated in this quote below from this website. "There are those who say that the beautifully grained milo wood utensils, furnishings and jewelry were only for the chiefs of ancient Hawai`i. It is told that the Waikiki home of Kamehameha I was surrounded by milo trees. Milo's scientific name is Thespesia populnea, and it is also known as a portia tree. 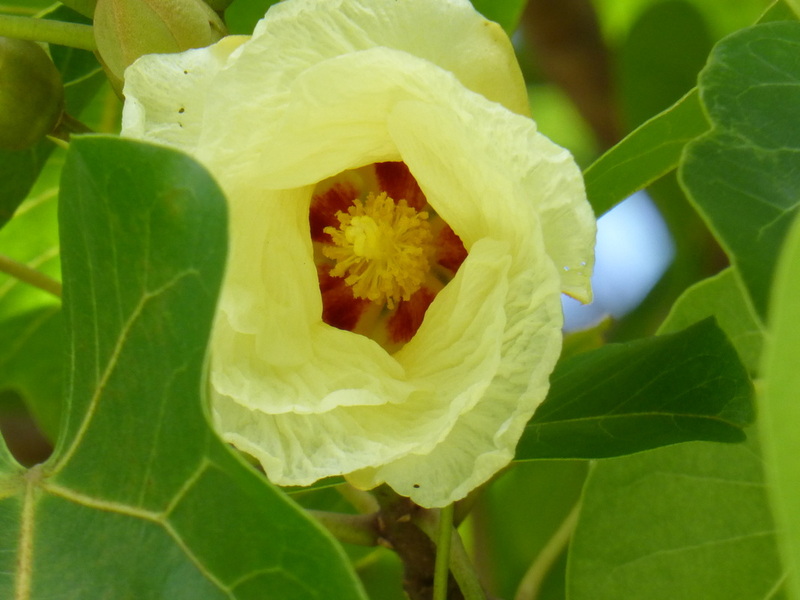 A member of the Hibiscus family, the malvacceae, it is a close relative of hau, `ilima, and ma`o, Hawai`i cotton. Milo wood has an attractive grain that takes to a high polish and, in addition to food utensils and containers, was fashioned into paddles and other carved objects, as well as for an occasional canoe, although koa was considered to be the most popular material for canoes." Beautiful flowers that bloom on the Milo tree. (Not our photo). For more scientific information on this exquisite tree, please click here. The flowers only last for one day, closing into and becoming a seed pod of sorts as shown in this photo below, none of which we've seen on the trimmed trees. The flowers as shown above bloom only for one day, later becoming these seed pods from which eight seeds are eventually released. (Not our photo). Mike also explained that the Milo tree does well growing near the sea and is unaffected by the salt from the sea which is very close to the Milo trees on the grounds here at Milowai. I was also curious as to the type of grass on the lawn here. It is so perfect, it almost appears as if it isn't real. But, it is real.. It's called South Coast from which a fake turf is actually named. It too, like the Milo tree, suffers no ill effects from its close proximity to the salt from the ocean. The carpet-like lawn at Milowai. Its ironic how we've dismissed this odd looking trimmed tree to discover that in fact, it has its own story to tell, profound in the history of the Hawaiian Islands and its people. Now, we look at it with new eyes and interest. Going forward, we'll make no effort to exclude it from our photos. This was the tiny freezer in Kenya. On this date a year ago, when we were leaving on December 1st, we assessed our food on hand to use in the remaining 16 days until we left for South Africa. And here we are now, assessing the food we have left for our departure date once again on December 1st before we leave for the Big Island. For details from that date, please click here. It is damp and drizzly here today (which we never turn down after our drought) and so it was great to see the beautiful pictures. Have a great weekend! Staci, we're so glad you enjoyed the Milo tree story. We love learning new things. We're always on the lookout for points of interest. As it turns out, it's raining here today too. We went out to the pool but had to come back in when the rains soaked us. We're sitting inside waiting for it to clear, hoping to go back out soon. But, we aren't complaining. It's been almost perfect every day since we arrived a month ago. We love the weather here! Hope you both have a fabulous weekend! Thanks for writing to us! We love hearing from you!